Excerpt from U.S. Coast Guard “Proceedings of the Marine Safety & Security Council” magazine by Petty Officer 1st Class Anastasia M. Devlin. A rainbow of uniformed guests milled around the reception. The conversation, hesitant and politely formal at first, flowed freely after dozens of meetings and discussions. These guests were delegates at a recent meeting of the North Pacific Coast Guard Forum (NPCGF), which has fostered cooperation among the six countries bordering the North Pacific Ocean since its inception in Tokyo in 2000. 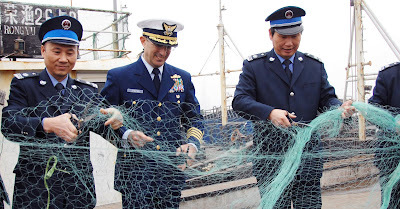 These common interests among the six countries, including drug trafficking, illegal immigration, maritime security, and fisheries enforcement, cultivate an environment where recommendations can be developed. To synchronize 71 delegates, 17 agencies, six countries, five languages, and hundreds of support staff takes an amazing amount of coordination and communication. Different security measures taken by each country about what information could be discussed was also a challenge that had to be worked through in order to achieve the level of collaboration needed to be productive. This preparation served to make the delegates feel comfortable so they could successfully do the job they came here to do: collaborate. The ideas that pass during these meetings have the potential to change policy and create an environment to make our world safer and more peaceful. Although conceptual at first, the forum has slowly generated results. Beginning in 2004, the international fleet of ships held communications drills, then full-scale drills, and, finally, combined law enforcement operations. By summer of 2007, the cooperative law enforcement effort had led to the apprehension of several vessels convicted of illegal fishing. The picture at left depicts part of a ceremony honoring the seizure of six fishing boats that were engaged in high-seas drift net fishing.